There are many things to like about this book, no matter which one of the big three traditions (Roman Catholic, Protestant, and Orthodox) you belong to. Chaput is a lucid writer who has clearly done his homework. His book ranges over many significant thinkers, past and present. His analysis of our cultural moment is sobering, but never gloomy. He well understands the indispensable virtue of Christian hope. I read Dreher’s The Benedict Option, but find Chaput’s approach much more in keeping with the entire record of Scripture. There are many terrific insights in this wonderfully conceived book. Since I am late to the party in reviewing this book, let me close with one massive implication that came to me in reading this book and it deals with Christian theology. For those of us Christians who gladly hold to more conservative or orthodox (small o) theology, there is something terribly important we can learn from Edmund Burke. Burke believed that the best of tradition is true, but to convince more radical types like Paine, it was crucial to also show the beauty of tradition. If I were to grade us conservative Christians on how well we do in showing the beauty of truth, I would give us a very low grade. If you are looking for a terrific biography of Jackson, this is the first place I would recommend. Taking a clue from Goldilocks some commentaries are too devotional, some too technical, and a smaller some are “just right.” Johnson has written one in that rarer, last category. Johnson’s commentary has responsible interaction with the text, he does not dodge the tough issues (an occupational hazard for commentators), and the flow is terrific. If the title of this book strikes you as odd, you will be convinced of its aptness after reading Johnson’s fine work. Thanks to our pastor, Peter Coelho, who enthusiastically mentioned this book in some of his sermons! 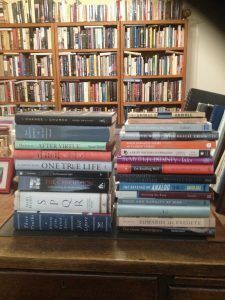 The biggest compliment I can give an author is that his or her book will be “part of our final library.” Let me explain. Our library has about 3,000 volumes. We are constantly culling it, but we are also constantly getting new books due to library sales (good and cheap way to get great books) and publishers sending me books for possible review/interview with the author. As I get older (I am 59) there is the need to keep culling. Fortunately, both our sons are readers so they will gladly inherit a bunch of books. Even so, there are books that should be parted with before I die. I don’t want our sons to have the burden of determining whether some books are worth keeping. Mark Edmundson’s book, self and soul: a Defense of Ideals (neither self nor soul are capitalized) is beautifully written, insightful, and full of suggestive ideas. It is clear that Edmundson has great respect for major religious figures, especially the Buddha and Jesus. It is not clear what Edmundson personally believes. Regardless of whether one is religious or not, there is much to be gained by a close read of this fine book. There are many things I found fascinating, but since most don’t read lengthy Amazon reviews, I will underscore just one. A whole chapter is devoted to showing that Shakespeare’s writings don’t offer us much direction for how to be virtuous. Sure, you could extrapolate some implications based on the loathsome exploits of various characters, but there is little that goes beyond their own self-interest. Edmundson writes that characters in Shakespeare “generally speak because they are trying to get something. They want to enhance their images, improve their lots, speed their designs.” In this same paragraph Edmundson says, “When we quote them, we import their desires into our speech.” As a Christian, I greatly appreciate a writer who is not afraid to underscore the power of words to form and fashion us. I am coming to this terrific book about five years after its publication, so no long review here. I will say it is an extremely well done piece of work, both witty and wise, entertaining and educational. You will learn a lot about Scripture and yourself by reading it! American Christians especially are in dire need of reckoning with this fine book. I will doing a longer review or perhaps interviewing the author later so will keep this brief. Dew is a wonderful writer, eminent scholar of the Civil War, and offers us a candid report of how he came to grips with the racism of his boyhood. A tough read, but sorely needed. 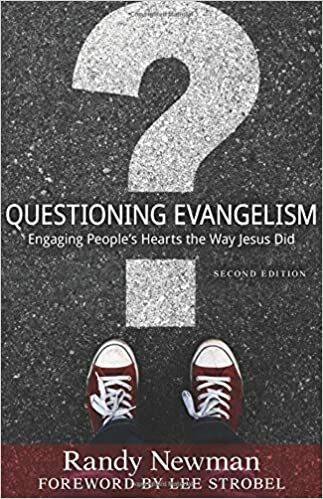 There’s nothing on evangelism quite like this book. Stay tuned for my interview with Randy! This entry was posted in Best Books of Year, Book Review, Favorite Books (Annual List) on December 16, 2017 by Dave. Surprised by Oxford by Carolyn Weber. Take a great chick flick (the kind most guys would grudgingly admit they liked), mix in great writing, candor, intellectual stimulation, spiritual insight, and humor. Voila you have Surprised by Oxford. Reading for Preaching by Cornelius Plantinga. My interview with the author is coming soon. Echoes of Eden by Jerram Barrs. My interview with the author is coming soon. The Taming of the Shrew (reread) by Mr. Shakespeare along with commentary from Brightest Heaven of Invention by Peter J. Leithart. Sacred Scripture, Sacred War by James P Byrd. My interview with the author is coming soon. College: What it Was, Is, and Should Be by Andrew Delbanco. Every Good Endeavor by Timothy Keller and Katherine Leary Alsdorf. I have read many books on “a theology of work.” This one has fresh insights and is very well done. Fateful Lightning by Allen C. Guelzo. A master historian, especially on the Civil War, shows us a scholar at the height of his powers. Much to ponder in this absorbing book. Revolutionary Summer by Joseph J. Ellis. 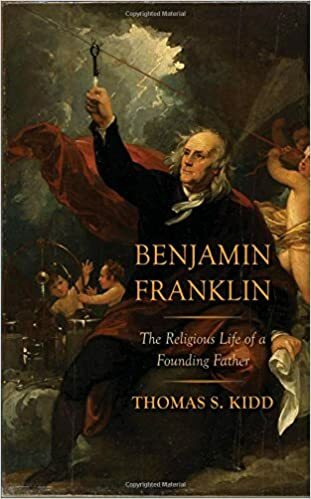 Years ago, I read the author’s Pulitzer-winner, Founding Brothers. This book is similar with its great story-telling and solid scholarship. Well, as things turn out, and it is pretty odd since I was not consciously thinking of it, my top two books are the first and last on this list: Surprised by Oxford and Contending for the Faith. This entry was posted in Best Books of Year, Favorite Books (Annual List), Reading on January 1, 2014 by Dave. The Pilgrim’s Progess by John Bunyan. The older I get, the more I am rereading. Since Spurgeon read it 100 times, I ought to try at least ten! Booked by Karen Swallow Prior. This is the kind of book which is sad to finish. Wonderful writing coupled with insightful truths about the human predicament. I will either be interviewing the author later this year or doing a larger review here. Stay tuned. On Conan Doyle by Michael Dirda. One of our youngest son’s friends is Muslim and so has never experienced Christmas. He wanted to do the whole exchanging of gifts, etc. This is the book he got me. A terrific book with fascinating background on how Conan Doyle developed his characters. Struggling with Scripture by Brueggemann, Placher, and Blount. A short book which helped me clarify once again why the more liberal position on Scripture is problematic. RetroChristianity by Svigel. I did a review of this terrific book over at Jesus Creed. Believing Again by Lundin. I am very interested in 19th century America and Lundin is a master of that period. Bible in Pocket, Gun in Hand by Phares. An entertaining look at the toughness of nineteenth century ministers who preached the gospel on the wild frontier. Ministers who think they have it rough today might want to give this book a read. Non ministers will equally enjoy this lively and interesting book. Our Triune God by Ryken and LeFebvre. The authors provide a concise, yet responsible overview. For those wanting a good primer on the trinity, this is a good place to start. Love Works by Manby. It sounds like a rather goofy and naive book, but it is actually quite good. Unlike the vast majority of business books, this author and successful business leader shares his own failures. One quibble: He should have said much more about humility. And he seems to hold the popular notion that humility is elusive. Overall, a wonderful book worth reading! This entry was posted in Best Books of Year, Favorite Books (Annual List), Reading on May 18, 2013 by Dave.